I have only been able to find one pattern of Clasp Knife marked Sterling. This is the second pattern. 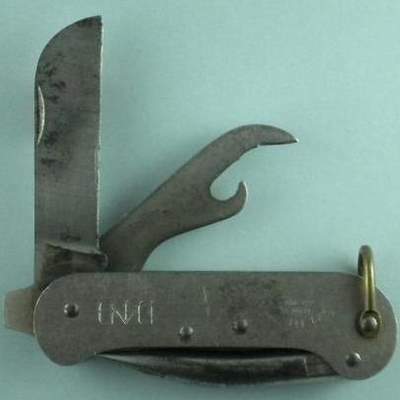 I would be very happy to hear from anyone who has any information as to whether any other patterns of Clasp Knife, or indeed any other models of knives were produced under the Sterling brand. This knife is dimensionally the same as the Whittingslowe Second Pattern Clasp Knife and was most certainly made in the Whittingslowe factory. The only difference with this knife is that it has a brass shackle, not a copper one. The makers mark is located on the right hand scale. The marks are from the knife above.